SEAN O’ROURKE IS A TRIAL LAWYER. IF YOU OR YOUR FAMILY ARE NOT TREATED FAIRLY, HE WILL TAKE YOUR CASE TO TRIAL. Sean O’Rourke, is a founding partner of Simon & O’Rourke, PC, in Houston, His vision for the firm was for it to be a true litigation firm that will not hesitate to argue an injured person’s case in a court room. Sean O’Rourke Trial Lawyer. Sean O’Rourke grew up in the maritime industry as the son of a Longshoreman on Galveston Island. After graduating from Ball High School Galveston, Texas in 1997, Sean attended Southwest Texas State University where he obtained a Bachelor of Science degree in Political Science in 2001, and then earned his law degree from Southern Methodist University School of Law. 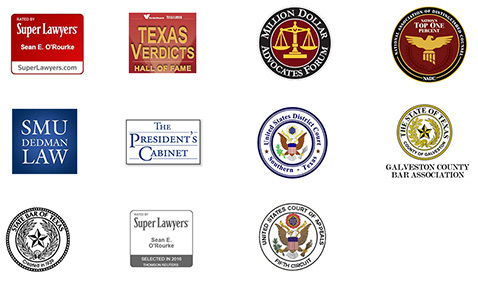 After graduating from law school in 2004, Sean began his practice in Dallas, Texas, where he defended corporations in all areas of civil litigation, in both state and federal courts. In 2006, Sean joined a prestigious litigation firm, where he represented working people in all aspects of civil litigation. Because of his background and practical understanding of all things maritime, Sean has focused on representing injured workers and their families in serious injury and wrongful death claims governed by the Jones Act and other maritime laws. Sean has gained considerable experience in this field and has handled more than one hundred cases for Jones Act seaman or other maritime workers. In 2014, Mr. O’Rourke co-founded Simon & O’Rourke on the Gulf Freeway. The office location allows him to handle cases in Galveston and Harris Counties. The offices close location to Hobby Airport allows him to easily travel to Dallas, San Antonio, the Rio Grande Valley and other areas where he has filed cases.